.... a stop at a popular watering hole in Downtown Ventura. You may have heard of it? 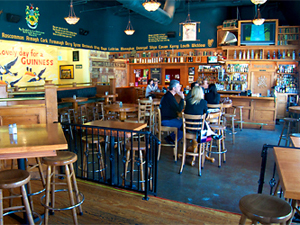 Dargan's Irish Pub? On the corner of Main and Chestnut? Just up from the Downtown Century movie theater? Dargan's, Ventura. Find it Downtown on the corner of Main and Chestnut. Yep, that's the one - whimsical Gaelic stenciled on the walls, Bangers & Mash on the menu and TV screens tuned to the sports channels. So, my latest visit to this pub was on a Saturday night. Didn't care to sample the menu this time, too busy waiting at the bar to get in the next round of drinks for me and my girlfriends. Alas, not a pint of something dark or an aged malt in sight among this teeteringly high heeled trio, just vodka tonics, martinis and dubious conversation about the state of said bangers. Dargan's - note the Guinness mural. The crowd is mainly younger of a nighttime - a shift from lunchtime shoppers and tourists to the movie crowd to bar hoppers stopping by on their way to late night mayhem. You can order 'Speciality Pints' here - which makes me smile affectionately as I reminisce of my late teens in the UK. If your aim is to get legless...quickly...then order a pint of Snakebite. Half cider, half lager...refreshingly lethal and leg removing to those who had just reached the tender British drinking age of 16...oops 18. 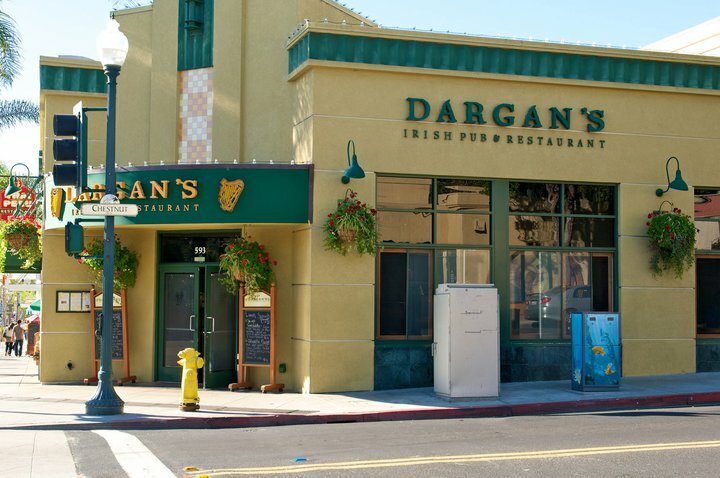 Dargan's does a good job of keeping it just Irish enough yet still reminds you it's still firmly rooted in California. You can order Guinness or Harp Beer with your Corned Beef & Cabbage any lunchtime, or watch the game munching Dargan's Irish Nacho's (yes, really) with a glass of Central Coast chardonnay. 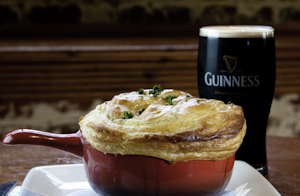 They do have live music during the week and on a Sunday, so if you fancy a fiddle with your Steak & Guinness Pie Dargan's is just the place to enjoy the craic. Steak & Guinness Pie at Dargan's.